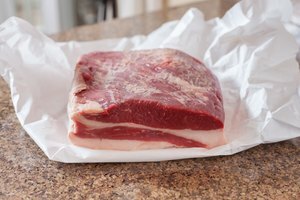 Smoking a rump roast on an outdoor cooker produces flavorful, tender beef with a tantalizing, smoky aroma. The beauty of smoking a large cut of beef is that the cooking essentially takes care of itself, with minimal involvement by the backyard chef. A rump up to 6 lb. can take up to three to four hours to smoke and require basting once per hour. Heat and smoke take care of the rest. 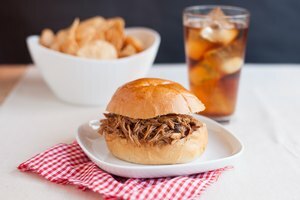 Soak 2 cups of wood chips in a metal bowl filled with water for at least an hour before smoking the roast. Use wood chips to impart a rich, smoky flavor and aroma in the beef. Hickory is the classic choice. Apple and oak produce intriguing, though more mellow flavors. Light a fire in the smoker with approximately 50 charcoal briquettes, which should be enough to cover the bottom of the fire grate for a consumer-size smoker. While the coals are getting hot, cut several incisions in the roast about 1 inch deep, then insert sliced garlic cloves into the cuts. The garlic will melt during the long smoke to flavor the meat deep throughout the roast. Baste the meat with a light coat of olive oil, then season the exterior with sea salt and cracked peppercorns to taste. Add other spices as desired. Rake the hot coals to one side of the fire bowl inside the smoker. Drain the wood chips and place on the white-hot coals. Immediately place the cooking grate on the smoker and scrub with the grill brush before basting with a light coat of olive oil to prevent the roast from sticking. Place the roast on the cooking grate on the side away from the coals, close the lid and adjust the vents to promote smoke circulation and oxygenate the fire to keep the coals glowing. 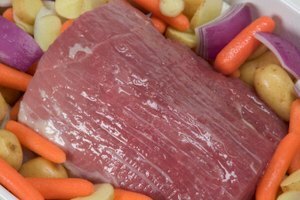 Baste the roast once per hour with red wine vinegar, checking the internal temperature each time with a meat thermometer. 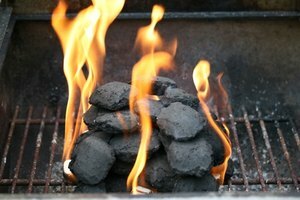 Add a few charcoal briquettes to the smoker if necessary to keep the fire going. Remove the roast from the smoker when the meat reaches an internal temperature of 130 degrees F for medium rare or 160 degrees F for medium. Transfer with hot mitts to a plate or carving board. Let the roast rest for 10 minutes before carving. Don't worry; it will not get cold. Juices retreat to the center of the roast to escape the heat during the long cooking process. A rest period before carving lets the juices flow back through the meat. Beef should be cooked to an internal temperature of at least 125 degrees F to be safe for consumption.